Greece's financial woes have been the stuff of Europe's recurring nightmares for the last five plus years. Now that the country is officially in default (arrears, to be precise) for failing to pay back 1.5 billion Euros to the IMF, the next major question is whether the Greek people will vote to stay in the Eurozone. 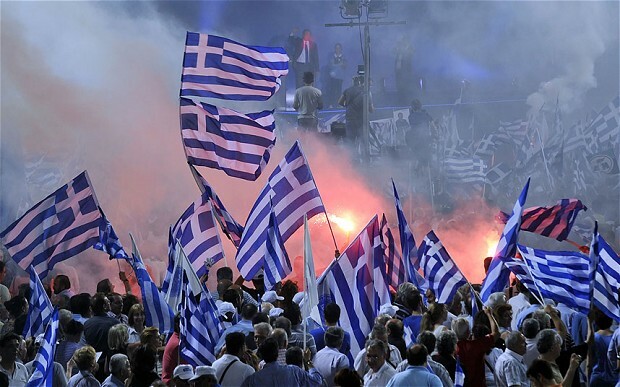 If Greece leaves, or if Greece goes bankrupt, the repercussions for the rest of Europe and the world could be severe. Below is a compilation of scholarly articles published in International Studies Quarterly that might give readers better insight into how Grexit might play out. Why is Greece's debt crisis such a big deal to the rest of Europe? Brooks, et al (2014) argue that sovereign debt isn't as sovereign as the term implies, especially when the country in question belongs to a shared regional classification such as the EU. When times are tough, the tough find friends... Allen & DiGiuseppe (2013) argue that when state access to affordable credit diminishes, leaders look to possible alliances to offset the negative fiscal and political consequences. The Eurozone has been characterized as an experiment in collective fiscal identity and shared norms, making the July 5 referendum such a critical moment. But do individual member states subscribe to the regional institution because of idea diffusion? Walsh (2001) suggests that members' domestic politics play a far more important role in fiscal preferences. Does it matter what type of state it is? Who is to blame for Greece's misfortunes? According to Fernández-Albertos, et al (2013), it depends on whom you ask. Using Spain as a case study, they find that partisan bias and the role of globalization help exonerate a state from full culpability and demonstrate certain citizens' willingness to point the finger at other European states. The Euro is dead, long live the drachma? ?